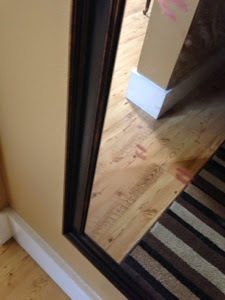 One of my daughters is obsessed with kissing herself in this mirror. Today Papa Tom came over for lunch and a project. 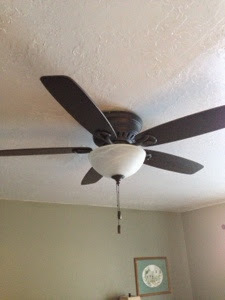 The ceiling fan in our bedroom is like 30 years old so we retired it today. Janie made sure it was free of all dust before it goes into the trash. 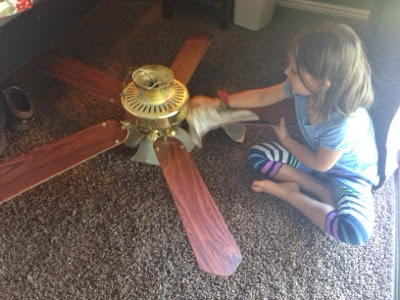 This fan was a bargain at $60. on sale at the online Costco. There was a reason the price was so low. It had all kinds of little glitches with the install. 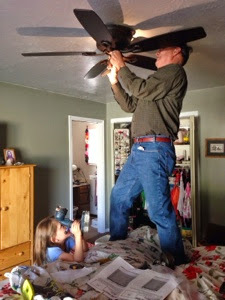 Thank goodness Papa Tom is a Master Electrician and after taking 3 times longer than it would to install a non-glitched fan he gotrdun :).